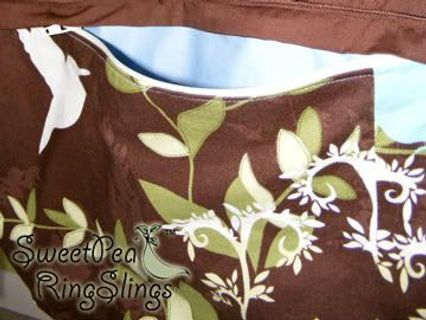 With each sling, (excluding water slings) you have the option to add a zippered pocket to the tail. The pocket is fully lined, sewn inside of the tail and closed with a 12 inch zipper. Each pocket is approximately 15 inches long and 10 inches deep. They are perfect for holding your keys, wallet, an extra diaper and a spit up rag. I never used a diaper bag with any of my children. I would put what I needed in the tail of my sling and be good to go! The zipper ensures you that your items are safe. For an additional $15, you can add a pocket to any sling (except for water slings) on the site. Just select this option when ordering your sling through PayPal. Example of a Solid Sling with a Pocket. 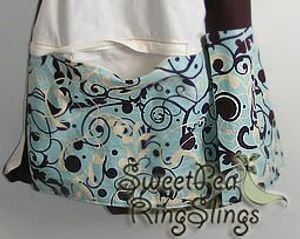 Every solid colored sling comes with a surprise print inside of the tail. 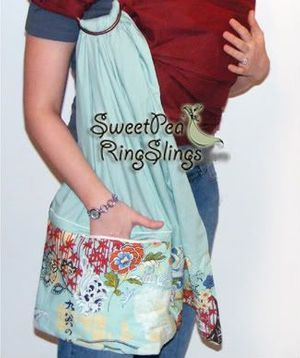 Artisan Slings and Print Slings have the pocket sewn inside of the tail print.